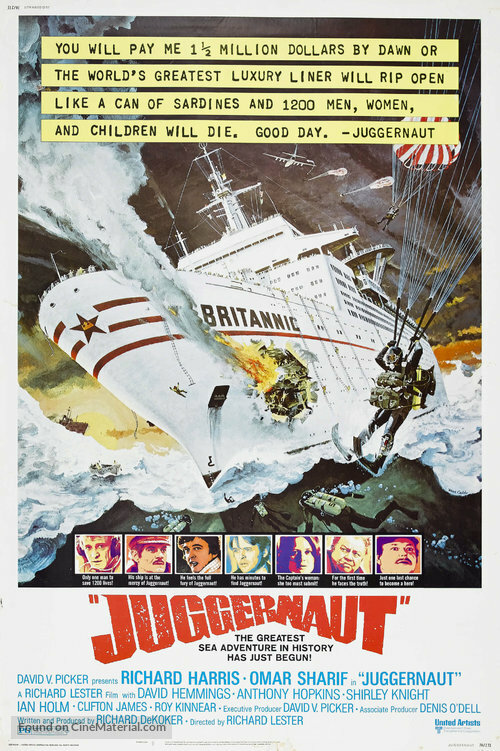 Brief Synopsis – After a mad bomber places a series of explosives on an ocean liner during its cross Atlantic voyage, the government and the owners of the ship argue whether to pay the ransom or try to diffuse the bombs. My Take on it – This is a film that I discovered existed a few months ago while looking at a list of disaster films from the 70’s. I didn’t really know what to expect from this film and had hopes that it would at least be somewhat thrilling. Unfortunately,this is an extremely weak disaster movie and lacks any real thrilling points along the way. The plot itself is quite reminiscent of Speed (1994) and it’s possible that they reused elements of this film in the bus thriller that came out 20 years later. The biggest problem with this film tho is that the story is also quite weak and the characters aren’t given enough to do נecause none of them are developed at all. The cast has some very talented actors but none of them are able to do much with what they are given. Richard Harris for instance is ok in the lead, but he plays the characters in such a somber way that even he looks bored at what he is given to do and lacks any kind of enthusiasm for his job as a bomb defuser which also takes away from the thrilling aspects of the story. Anthony Hopkins is also ok here as a police detective trying to find the bomber while his family is also on board the booby-trapped ship. He isn’t given enough to do here and also feels very stereotypical. It’s nice seeing him here, but quite unmemorable. Omar Sharif plays the ship’s captain and he also isn’t developed well enough for us to care about what happens to him or what he does for that matter. The thrills are few and far between and that lack of excitement just doesn’t help make this film enjoyable enough which is a shame. Bottom Line – Pretty weak disaster movie that isn’t thrilling enough. The biggest problem here is that the story and characters are not powerful enough. Harris is ok in the lead but doesn’t seem to bring enough enthusiasm to the role to help make the story feel realistically thrilling. Nice seeing Hopkins in an early role even if he isn’t given that much to do. Sharif s also ok as the ship’s captain but he do is wasted in this role. There are points throughout the film that make it slightly feel like a precursor to Speed (1994), but it doesn’t even come close in terms of thrills which is quite disappointing.